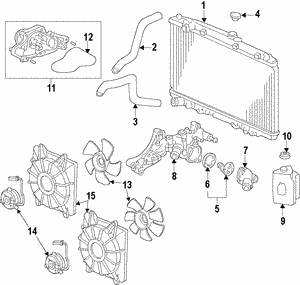 All Discount Parts carries a number of Honda Crosstour genuine OEM parts, including the all-important radiator. 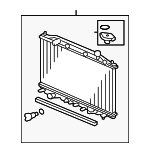 If you’re looking to replace your Honda Crosstour radiator, make sure you replace it with one of our quality parts. If you’re not sure whether your Honda Crosstour radiator needs replacing, then continue reading to learn about what you should be watching for. Visible Leaking: Ensure that the drain valve has been securely shut. If it is and you’re still losing coolant, then this is a likely sign it need to be replaced. Damaging Rusting: If you notice that the lower half of your radiator has signs of rust, it is likely functioning at a suboptimal level and needs to be replaced. Radiator Flush Machine Results: Your radiator is probably faulty if you run a diagnostic at your service center and find that rust or mineral buildup has restricted proper flow. Incorrect Thermostat Results: Your thermostat will give false temperature readings if the radiator is not working correctly, and your car may not be able to regulate safe internal temperatures that typically prevent overheating and corrosion. Overheating: With an incorrect thermostat, a failing radiator will overheat because it doesn’t allow your vehicle to extract heat from your engine’s coolant. Coolant Loss: A damaged radiator may cause leaking if it cannot adequately manage vital fluids like coolant and antifreeze. 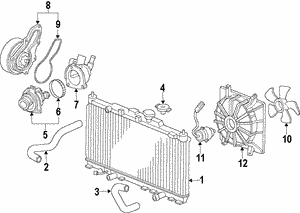 Why Choose All Discount Parts to Supply Your Honda Crosstour Radiator? When it comes to a vital component like your radiator, it’s important to get genuine OEM Honda parts — like the ones we sell — rather than aftermarket components because they fit perfectly with your Honda Crosstour, they are of high quality, and they come with a warranty. You can order online — in-stock parts will ship within 24 – 48 hours. For more information about your Honda Crosstour radiator or any other Crosstour part, contact us online or call 800-651-4832.